Waffles, generally, aren’t synonymous with healthy food. In fact, if you’ve ever seen a recipe for waffles made from scratch, you know that they’re just like pancakes — with a lot more butter. The nutrition experts at Beachbody figured out how to make waffles much better for you without losing any of the flavor or satisfying crunch. We replaced most of the refined flour with whole-wheat flour, leaving just enough all-purpose flour to keep them light and fluffy inside. They’ve also got ground flax seeds for extra fiber and texture. And these waffles are lightly sweet thanks to a generous pour of maple syrup that’s baked right in! Top these whole-wheat waffles with fresh fruit, peanut butter, or plain Greek yogurt sweetened with a touch of honey or maple syrup. Or make a simple fruit sauce by heating berries in a pan coated with nonstick spray for 2 to 3 minutes. They’ll get sweeter and juicier as they cook. Add a Tbsp. of water, and crush the berries to release their juice. 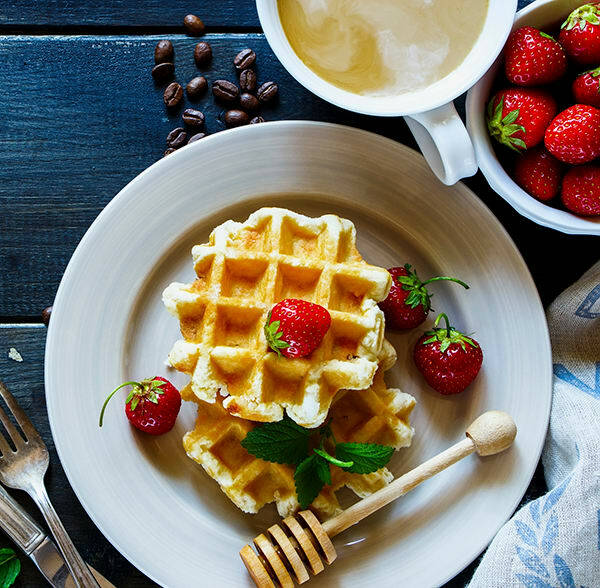 Freeze your much healthier whole-wheat waffles and have a wholesome breakfast at your fingertips any time you need it. To freeze waffles, first, allow them to cool fully. Then, arrange the waffles in a single layer on a baking sheet lined with parchment paper. Freeze them for about two hours, then transfer the waffles to a freezer-safe bag or container. To reheat, simply pop one or two in a toaster until they’re crisp and warmed through. Waffles can also be reheated in an oven or toaster oven heated to 350°F for about 10 minutes. These whole-wheat waffles are made with mostly whole-wheat flour, leaving just enough all-purpose flour to keep them light and fluffy inside. Combine flours, baking powder, flax seed, and salt in a medium bowl; mix well. Set aside. Combine eggs, almond milk, maple syrup, and oil in a large bowl; mix well. Add flour mixture. Mix until blended. Pour ¾ cup of batter at a time onto hot waffle iron, lightly coated with spray. Cook waffles until golden brown and crisp. One serving equals one waffle; leftover waffles can be wrapped up and frozen.